Oceanography is on the verge of a revolution. Instead of sporadic, expeditionary glimpses of the ocean from ships and subs, oceanographers would like to establish a permanent presence in the ocean. 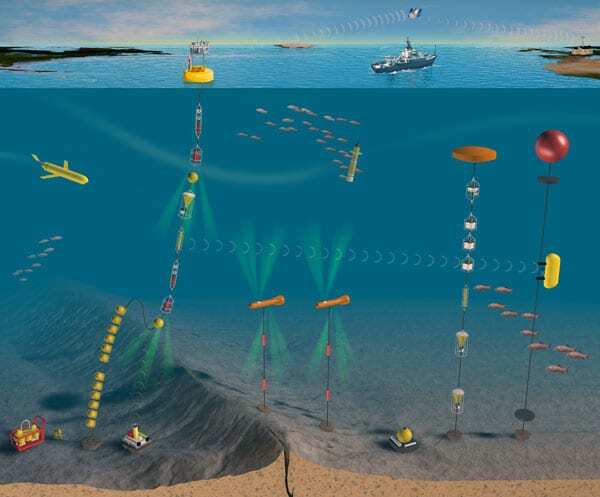 Like the engineers who crafted the Interstate Highway System, researchers have been planning an infrastructure of long-term ocean-observing outposts that can transmit round-the-clock data from remote oceans to shore-based scientists. As of July, the dream took a big step toward reality: Both the House and Senate Appropriations Committees have approved a 2007 budget for the National Science Foundation (NSF) that includes a $13.5 million down payment on the Ocean Observatories Initiative (OOI). 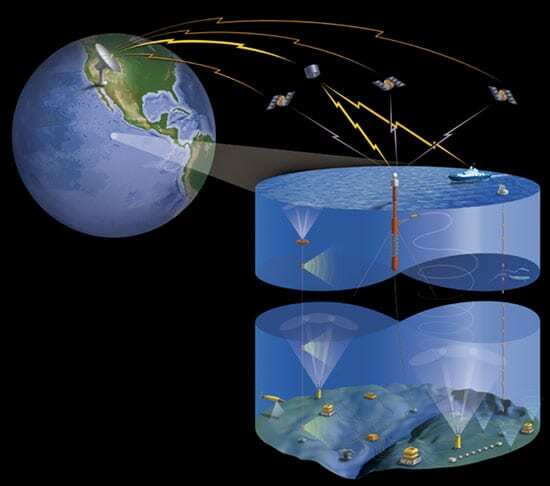 The vision is to construct a network of ocean platforms—with instruments and sensors, long-term power supplies, advanced computer command and storage capability, and fiber-optic cables or satellite and acoustic communications systems—all feeding continuous streams of data and imagery back to researchers and the Internet. Just as networks of meteorological stations have revolutionized our understanding of the weather, ocean observatories will give scientists an unprecedented ability to monitor long-term patterns and changes in the sea and to detect energetic, infrequent events that previously went unobserved. Indeed, OOI may be the biggest program in the history of ocean science—not only in dollars, but in the amount of effort expended to forge collaborations among researchers who have historically pursued research through individual projects or expeditions. Now hundreds of ocean scientists have been asked to look past parochial interests, conceive a common vision, and share a community resource. Because the 2007 NSF budgets proposed by the Bush Administration and approved by congressional appropriations committees both contain funding for OOI, the observatory initiative seems poised to launch when the final 2007 federal budget is approved in the fall. With the initiative, NSF proposes to spend $309.5 million over six years to build an integrated observatory network. Another $240 million would be paid out of the NSF research budget over eight years for maintenance and operations. 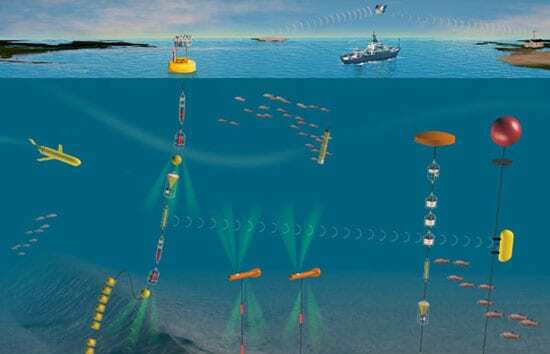 The project will be managed by the scientist-led Ocean Research Interactive Observatory Networks (ORION), which will contract with oceanographic institutions and companies to build the pieces. Even with additional funds to operate and maintain the network, the cost is still less than that of one space shuttle flight. It is half of the cost of building a new Yankee Stadium. Many of the most fundamental, planet-shaping processes occur in the ocean, out of human sight. The majority of earthquakes and volcanoes erupt beneath this watery blanket, building and consuming Earth’s crust. Mineral-rich fluids spew from the seafloor. Circulating currents move climate-driving heat and moisture around the globe. Strange organisms grow in the depths beyond the influence of sunlight, providing a glimpse of perhaps the earliest life on the planet. Citizens, sailors, and scientists have glimpsed these processes—first from the shore, then from ships, buoys, and submersibles, and recently from satellites. Each approach has advanced our understanding of the oceans. But each view has been limited. Research cruises last only a few days or weeks and don’t allow researchers to observe changes over seasons or years. Instruments on satellites offer broad and long-term observations, but they typically penetrate just the top few meters of water. Moorings, buoys, and drifters have revealed much about the long-term patterns and changes in the sea. But such tools have been limited by the availability of ships to deploy them, the volume of data that could be stored, and the strength and longevity of the batteries. Advances in communications, robotics, computing, platform design, power systems, and sensor technology now make it possible to get broader and deeper views of the seas over longer periods. With Internet technologies, that information can be shared in real time with scientific colleagues, policymakers, educators, and students thousands of miles away. The observatory-based approach to ocean science is already changing the field. A consortium of Canadian-led institutions turned on the Victoria Experimental Network Under the Sea (VENUS) off Vancouver Island earlier this year, and a group of American institutions led by Monterey Bay Aquarium Research Institute is about to build the Monterey Accelerated Research System (MARS) off the California coast. 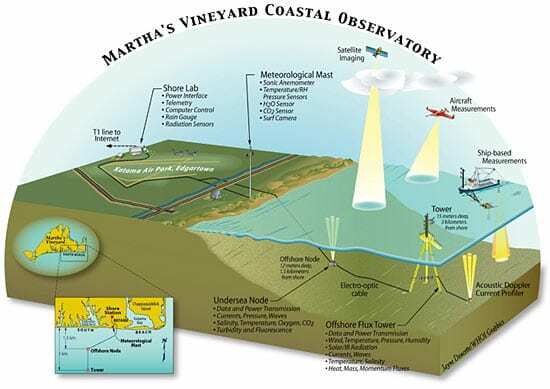 Woods Hole Oceanographic Institution has been operating the Martha’s Vineyard Coastal Observatory since 2002, after partnering with Rutgers University on the Long-term Ecosystem Observatory and with the University of Hawaii on the Hawaii-2 Observatory. OOI will significantly amplify the complexity and scale of such efforts. This new wave has been building for decades. Renowned oceanographer Henry Stommel worked on the first observatory off Bermuda in the 1950s, though the project was ultimately abandoned. A new generation of scientists began advocating for observatories in the late 1980s. Since then, more than 40 workshops, reports, and proof-of-concept projects have been developing the platforms from which the science can make its next great leap. “We had to work to reach a point where we could show Congress and the Administration that we knew what we wanted to do and how we were going to do it,” said Isern. In 2005, NSF and ORION asked the ocean science community to start making choices and to develop a clear roadmap; 549 scientists and engineers from 137 institutions and companies responded. Collectively, they offered 48 different proposals for coastal, global, and regional cabled observatories (see article below). In March 2006, more than 300 scientists met to further pare down the list of ideas, and 85 of their colleagues have been working since April to formulate specific recommendations for where and how to build ocean observatories. At press time, the ORION team was leaning toward developing a vast cabled observatory off the Pacific Northwest coast (the North East Pacific Time-integrated Undersea Networked Experiments, or NEPTUNE); a set of long-duration buoys that can fill in the gaps between existing U.S. and international monitoring programs; two fixed, cabled coastal observatories (one each for the Atlantic and Pacific); and a coastal “pioneer array” that can be moved from one part of the world to another. The goal is to start construction by the end of 2007 and to launch the first OOI-related science experiments by 2008. But the hopes of the ocean science community are mostly in the hands of Congress right now. “A commitment to OOI would mean recognition of the importance of ocean research to the nation,” Detrick said. Editor’s Note: Of the 85 scientists and engineers who have served in leadership positions or on the advisory committees for the ORION program, 11 are currently affiliated with Woods Hole Oceanographic Institution. Senior Scientist Ken Brink served as the first Project Director from 2004 through 2005. Senior Scientist and WHOI Vice President Bob Detrick is the current chair of the Observatory Steering Committee. Senior Research Specialist Dan Frye, Senior Scientist Bob Weller, and Vice President Jim Yoder have served on the steering committee at various points over the past three years. The current ORION Science and Technology Advisory Committee includes WHOI Senior Scientist John Trowbridge and Research Specialist John Collins. Senior Scientist Alan Chave and Senior Research Specialist Dan Frye serve on the Engineering Committee. Associate Scientist Scott Gallager and Assistant Scientist Sheri White are members of the Sensors Committee. Senior Information Systems Specialist Andy Maffei participates in the Cyberinfrastructure Committee. connect multiple instruments in a seafloor power and telecommunications grid. processes across an entire tectonic plate. air-sea interactions, and ocean circulation. What Is an Ocean Observatory?